Eric Trupheme at Ocean Independence asks me to announce a further €300,000 price drop on his central listing for sale, the 39.6m motor yacht Ineke IV. Designed by Phil Curran, Ineke IV was built by Lloyd’s Ships to RINA class in 1990. Under the same ownership for 20 years, she has an excellent charter record. Accommodation is for 10 guests in an owners’ suite and four staterooms. The master suite is on the main deck and has a his and hers en suite while two twin cabins, both en suite, can be converted into doubles. On the upper deck there is a large library and forward of this is a double VIP stateroom with en suite shower bathroom. Ineke IV has an interior decorated to a high standard featuring highly polished Australian rosewood and Brazilian mahogany panelling. A huge main saloon boasts extensive seating, a bar, dining area and full entertainment system. She is powered by twin 1,750hp Caterpillar engines giving a cruising speed of 15 knots. 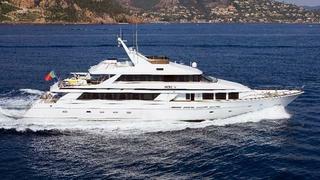 Lying in Cannes, France, Ineke IV is down from €2.5 million to €2.2 million, VAT included.